Input Logic launches beautifully crafted software products for top brands and startups. Input Logic was founded in 2011 in Nanaimo by two cousins, Shawn Adrian and Gavin Vickery, who hailed originally from Saskatchewan and Alberta and were drawn to the west coast for the weather. Like many tech startups, Input Logic’s founders Gavin and Shawn were a software developer and designer who originally set out to launch their own SaaS products. Right away in 2011, Input released QuoteRobot, a proposal writing and invoicing tool for freelance web designers that has grown to over 15,000 users. In 2013, while writing help documentation for QuoteRobot, the pair ran into the need to launch a help web site, and came up with the idea of managing a web site using content from the popular Silicon Valley based note-taking app Evernote. Postach.io was launched and quickly grew to over 100,000 users. 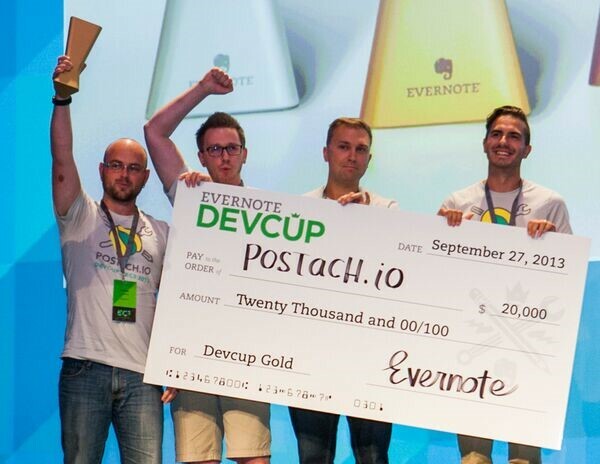 While working on Postachio, the Input Logic team won Evernote’s developer cup competition, beating out 150 other companies gloablly, where MC Hammer awarded them the top prize of $20,000 for contributing to the Evernote software ecosystem. In 2015, Input Logic sold Postachio and has since focused on helping startups and brands launch beautifully crafted software products. With a team of 13 designers and developers, Input Logic creates web and mobile products for companies like NetGear, Lululemon, Nest, Michael Kors, and JYSK. The team at Input Logic chose to locate their office downtown because the team likes the walkability of the downtown core, with so many great restaurants nearby. Also, the proximity to the University (VIU) means students and recent graduates have easy access to their office. Both Gavin and Shawn are regularly invited to speak at classes at VIU. The employees at Input Logic move to Nanaimo for the outdoor lifestyle — mountain biking, hiking, and running being the most popular after work activities. With the majority of Input Logic’s customers being located in San Francisco and New York, the easy float-plane ride to YVR is a necessity for doing business from Nanaimo. Additionally, many US based technology companies such as Salesforce, Facebook, Mozilla, and Microsoft have offices in Vancouver, which allows the team at Input Logic to stay connected to Silicon Valley while enjoying the outdoor lifestyle that the team desires.